The Big Easy, New Orleans LA. Way too much culture, fun and craziness squeezed into such a relatively small area. From Metarie to Chef Menteur Highway the city is teeming with unique places to eat, stay and enjoy. And party! Halloween in New Orleans means fun for kids of course, but it’s really an adult city and New Orleans Halloween means big easy fun for all folks looking to get crazy, imbibe and then party some more. This town doesn’t do anything small and Halloween is now exception. 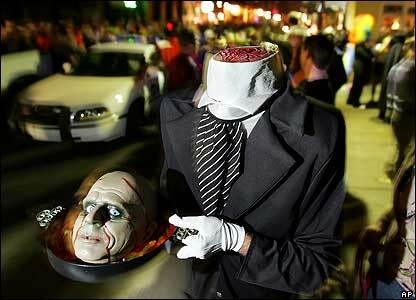 Halloween night, October 31, falls on a Thursday in 2013, so much of the action will take place the preceding weekend. The dates for this year’s “Boo at the Zoo” are Friday and Saturday October 18 and 19 and October 25 and 26. The zoo will close at 3 p.m. on those days and remain open to those who have tickets for the special event: children up to the age of 12 and their parents. This is a city so rich in haunted history it is widely known as “The Most Haunted City in America.” Because of this there is no better place in this country to party on the weirdest night of the year. New Orleans Man MaskPrice: $14.99Buy it!Description:Men's New Orleans style masquerade ball mask. Beautiful gold trim.